It's Heartfelt Creations inspiration Wednesday and the release of the absolutely gorgeous Classic Petunia Collection! No flower signifies summer more than the large trumpet shaped blossom of the gentle petunia! projects I submitted when I was applying to become a Design Team member. Other products: Pearl White Metallic card stock, White card stock , Memento Grape Jelly Ink Pad, Misti, Memento Markers Bamboo Leaves, New Sprout, Lilac Posies, Lulu Lavender and Sweet Plum, Hot Glue Gun, Vellum Paper, VersaMark ink, Melon Mambo Embossing powder, Dimensional Tape, Spellbinders Reflective Moments Die, Spellbinders Medallion Three Die, Big Shot, Grand Calibur. Watch this tutorial to see how to shape the petunias https://youtu.be/KOy_qNB9OAk. Card: Finished card size is 6” x 6”. Cut the card base using White Pearl 12” x 12” Metallic paper to 6" x 10 1/2". Score at 6" and 9" and fold to form easel. Cut a 6" x 5 3/4" panel from the same card stock and die cut the top and bottom using the Regal Borders and Pockets Die. Cut a 3" x 5 3/4" panel from the Classic Petunia Paper and cut using the edge Die from the Regal Borders and Pockets Die, ink the edges and adhere to the panel using Dries Clear Glue. Attach this panel with the Regal Borders to the 1 1/2" section of the folded base using Dries Clear Glue. Cut two more 3" x 5 3/4” panels from the designer paper, ink edges and adhere to the card. Cut It's a Wonderful Day 6” x 6” panel from the designer paper and trim to 5 3/4" x 5 3/4", ink edges and adhere to the card base. 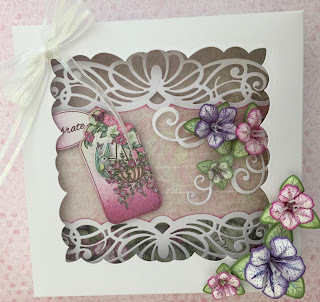 Stamp, color and cut flowers from white card stock using Berrylicious, Lilac Posies, Rose Bud, Bamboo Leaves, Grape Jelly and New sprout inks. Use the Stack and Store Daubers and the Dove Blending Kit to color. Shape them with the Deluxe Flower Shaping Kit. Cut the stamens from vellum paper and shape. Glue stamens and prills to the flower centers. 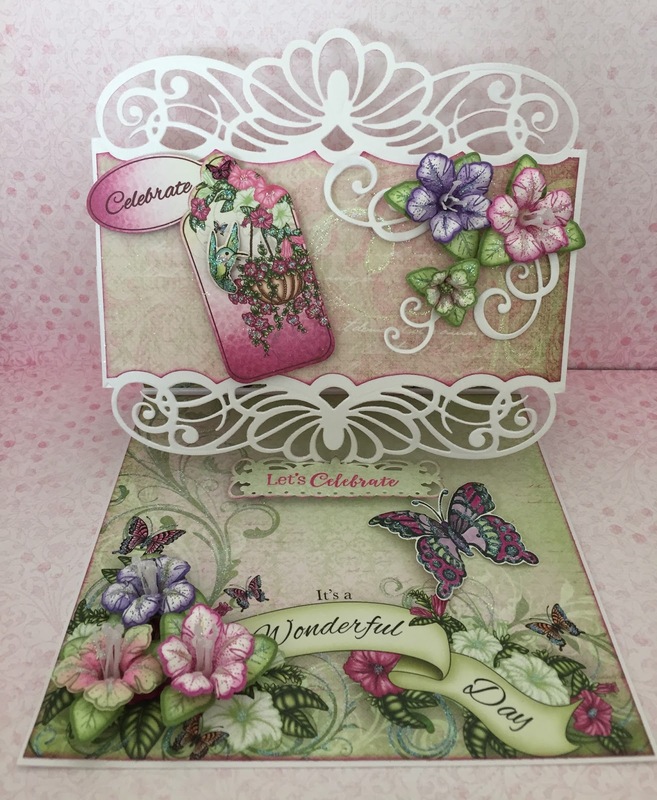 Cut flourishes from Enchanted Mum Die and adhere to card along with flowers and leaves as shown. Cut the tags from the designer paper using the Luggage and Tags Die, add butterfly brad - glitter and adhere to card with Dimensional tape. Cut hummingbird from the Botanic Orchid Paper Collection, shape, spray with Shimmer Spritz, glitter and adhere to tag. Using Tuxedo Black Ink, stamp the butterfly from Butterfly Medley Stamp Set, cut with the Butterfly Medley Die, color with markers, shape, spray with Shimmer Spritz, glitter and adhere to card. 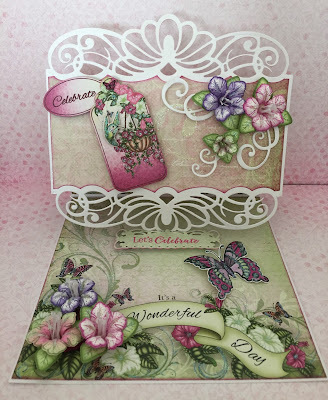 Stamp sentiment on designer paper with VersaMark and heat emboss with Melon Mambo embossing powder. Cut out using label Die from Spellbinders Reflective Moments Die and adhere to card with Double Dots 3D Foam Circles as shown. Box Bottom: Cut a 8 1/4" x 8 1/4" panel from white pearl metallic cardstock. Score at one inch all the way around. Cut slits in the corners and make notches. Fold at score lines and glue with Dries Clear Glue. I use clips to hold the corners until the glue dries. Box Top: Cut the top 1/16" larger than the bottom. Score at one inch all the way around. Cut an aperture in the middle using Spellbinders Medallion Three Die and make a window using Clear Cardstock. Cut the corners, fold and glue. Decorate with flowers and a bow. Thank you so much for stopping by...I really do appreciate you! I love all the attention to detail! Gorgeous flowers! Love it, love it!!! Absolutely gorgeous! Ansolutely gorgeous project....loved those Petunis. I love your gorgeous easel card. Beautiful detail! Thank you so much...you made my day!! !